Colin O’Brien has announced dates for his tour in New South Wales and Victoria. Colin O’Brien’s music is informed by the past and speaks to the present. A playful performer, Colin delights his audiences with fiery melodies, groovy rhythms, soulful lyrics, fancy footwork and old time hat tricks. His banjo, fiddle and guitar playing, percussive dancing, and lyrics all express an earnest regard for the traditional, natural and true. O’Brien is a nationally touring independent performer based in Nashville. He has shared bills with artists such as The Infamous String Dusters, Great American Taxi, Trampled By Turtles, Tim O’Brien, Del McCoury, Steve Martin, Sam Bush, Darol Anger and Peter Rowan. Colin has performed at many venues and festivals throughout the United States including Rocky Grass, The John Hartford Memorial Festival Boats and Bluegrass, Woodsongs Old Time Radio Hour, The Station Inn, The Sioux River Folk Festival, The Ark and dozens more. Colin loves to engage his audience, young and old alike, and may at any time leave the stage to dance and sing among them; his voice, fiddle and feet all still resounding loud and clear through the stage speakers. In 2011, the great Nashville musician, Larry Perkins, heard Colin play at the John Hartford Memorial Festival and was side-struck. “Colin’s music is genuine, whimsical, full of fun and carefully crafted. For me, it’s a very pleasant surprise”. He invited Colin down to Nashville to record. The resulting After A Song features Colin’s original songs performed with several of John Hartford’s band mates, including Perkins himself. 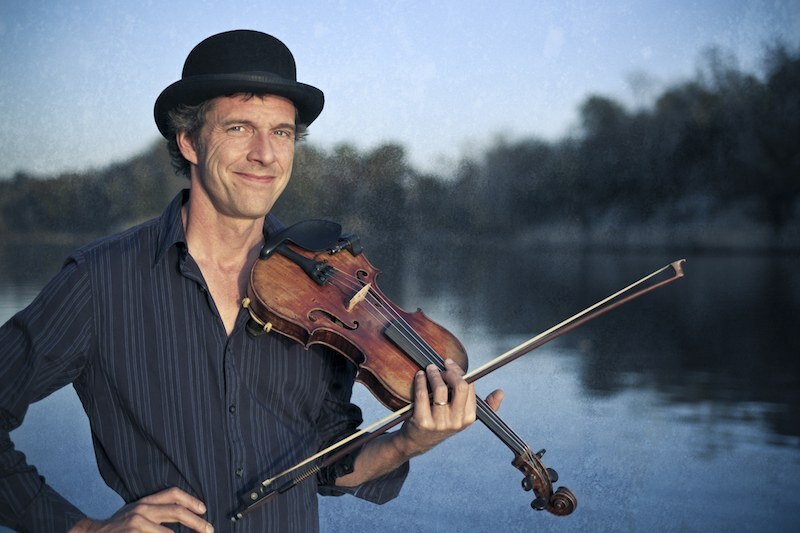 In addition to his solo song and dance, Mr. O’Brien performs with The Nashville Stringy-Band, an acoustic super-group featuring Matt Combs on fiddle, Mike Compton on mandolin and Todd Phillips on bass. When not entertaining on the road, O’Brien may be found dancing in his front yard on the banks of the Cumberland River with his fiddle and banjo as the General Jackson steamboat rounds Hartford’s bend.